Downtown La Grange on any day or night is bustling with activity and features a myriad of dining, shopping and entertainment options including a multi-screen movie theater. 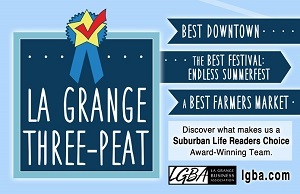 La Grange is an award-winning Village, featured prominently in several magazines such as Chicago Magazine and West Suburban Living, including a Best Downtown and Best Places to Live designation. ABC 7 highlighted the 25th Anniversary of the La Grange Holiday Walk on December 5, with Nancy Cummings from the La Grange Business Association describing all the great shopping opportunities in La Grange. WGN's Ana Belaval spent a morning in downtown La Grange, riding a fire truck with Santa and visiting several local merchants to celebrate Hometown Holiday. NBC 5 Chicago was out and about around La Grange on Small Business Saturday, showcasing several local shops and promoting the La Grange Holiday Shopping Rebate Program that runs through December. Nancy Cummings, Executive Director of the La Grange Business Association, recently appeared on the Weekend Web on NBC 5 Chicago and promoted several local business offering high-tech holiday gifts. Aracely's Bakery in downtown La Grange was recently featured on Chicago Fox 32's Good Day Chicago. In this video, Aracely's owner Junior Pinal shows off the bakery's popular Cubs-themed cookies and cakes. La Grange is known for its unique and notable events including the annual Pet Parade, Craft Show, Endless Summerfest, West End Art Festival, Halloween Walk and Holiday Walk. Please visit the La Grange Business Association for more information regarding these events. "Lots of little suburban downtowns have filled up with appealing restaurants and stylish boutiques. But In La Grange, something unusual has happened. While many hot newcomers have sprouted in the six-square block center, some tried-and-true old-timers like the hardware store, art league and the camera shops have stuck around, too. The 6th Avenue Parking Deck on Thursdays is the site of a good farmers' market. It all feels like Mayberry for the 21st Century-and around here, the police officers patrol the streets on Segways." Chosen as Top Transit Suburb in Metro Chicago by Chaddick Institute in 2012. La Grange was named one of the 20 "Top Transit Suburbs" of Metropolitan Chicago by the Chaddick Institute for Metropolitan Development, DePaul University. The report evaluates the region's suburbs on the basis of their attractiveness to those with lifestyles oriented toward the use of public transportation. Factors considered are station facilities, amenities and services available to those traveling without a car, the vibrancy of retail areas adjacent to commuter-rail stations and a community's public transportation culture as demonstrated by the number and share of residents who walk or bike to the train. La Grange Looks to Attract Millennials. La Grange was featured on WGN radio in recognition that the community encourages and supports a wide variety of independent retailers; creates fun and enriching events that attract young families; and works to encourage restaurateurs that are creating distinctive dining experiences that millennials seek. 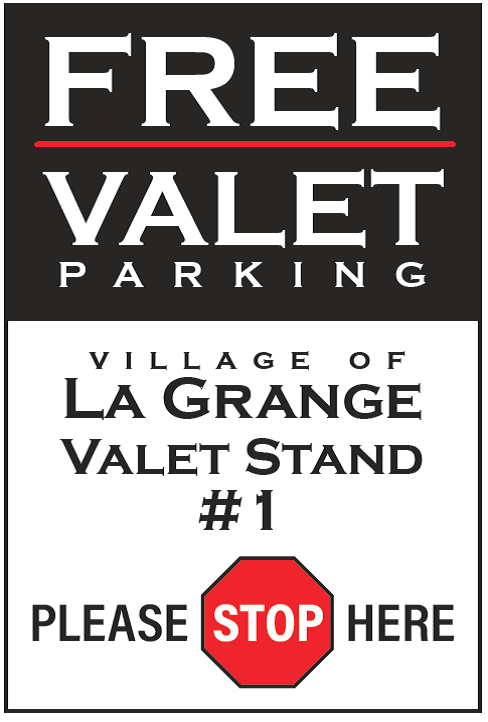 Planning a visit to our community or the La Grange area? Find details on various area attractions. View location and contact information for area shops and businesses. Find links to area organizations that work side by side with the Village in achieving a vibrant and dynamic community experience. Find location and contact information for area dining and entertainment options. Find details on area special events including art festivals, craft shows, holiday activities, farmer's market, and more. View La Grange area lodging options. Discover La Grange's advantage of being easily accessible from every direction. View overnight parking restrictions, area free parking lots, and more. View La Grange area public transportation information. Need to ask us a question? Feel free to reach us via email using the contact us form. All comments will receive a reply as soon as possible.